Chinese studio OEU-ChaO has modernised a residence in one of Beijing's historic hutong neighbourhoods with a white steel-framed extension and plenty of windows. 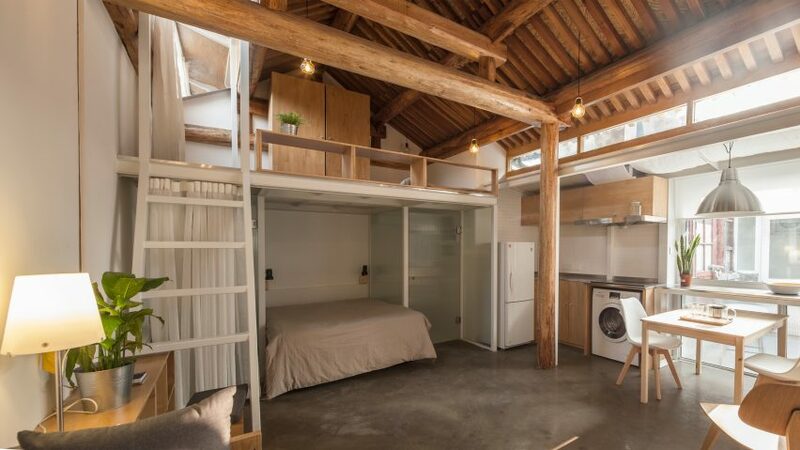 Architect Zhi Cheng renovated and extended the dilapidated Xirongxian Hutong property for a young couple and their six-year-old son. Measuring just 32 square metres, the residence is surrounded by five similarly petite properties that encircle an outdoor courtyard. Prior to the renovation, the house only featured windows on its south facing wall. Cheng added three lightweight steel structures to the property to bring more light into the home and create a better connection to the yard outside, without damaging the existing wooden structure. "They construct a gradation between public and private, outside and inside, build a path for light, wind, events and people's movement," said Cheng. "Also, the cooperation between new elements and original building structures establish the connection between past and present," he added. One of these structures replaces the wall that faces the courtyard with large windows slotted into the framework. It extends the property to the front with the doorway occupying one side. A metal counter bridging the volume creates a kitchen worktop with sink inside, and an outdoor dining area. "The new spaces created are the two long tables constructed based on the window from the outside to inside," explained the architect. "When the window is opened, people might sitting around the table in good weather, events might happen here," he continued. "Since there is limited area in the room, the table places some daily events out in the yard." The architect also incorporated the chimney and air system into the roof to improve air flow within the residence. A second frame adjoins adjacently to this one, making a covered pathway that leads from the street into the house. Inside, the third frame partly extends into the roof of the building adding a new north-facing window, which creates a route for air to flow throughout the residence. The unit adds a new mezzanine level to the residence for the children's bedroom, which is accessed by a ladder and features a wooden shelf that acts as a headboard and study area. The parent's bedroom and a toilet in a translucent glass volume occupies the space underneath. A lightweight white curtain can be drawn across the space to provide privacy from the open-plan living, kitchen and dining room that occupies the rest of the property. To maximise the size of this area, the architect arranged furniture and equipment around the perimeter. The kitchen occupies the corner on one side, and a light wooden table can be pulled out from beneath the metal counter for the family to eat inside. A thin wooden bookshelf runs along on wall. Set adjacent to this is a lower set of shelves with a built in sofa. The light wooden furniture, as well as white-painted walls, and grey flooring are intended to offset the darker wooden structure of the original building. Significant restoration works in Beijing's hutongs are seeing the creation of modernised homes, cafes and hotels. Zhang Ke used a series of new insertions to create hubs of communal activity for one hutong property, while MAD designed a series of bubble-shaped additions to another. Photography is by Zhi Cheng.